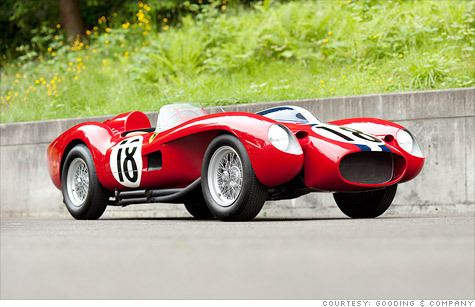 A 1957 Ferrari Testa Rossa sold for $16.4 million, the highest price ever paid for a car at auction. NEW YORK (CNNMoney) -- A 1957 Ferrari Testa Rossa racecar sold at a California auction Saturday for $16.4 million, the highest amount ever paid for any car at auction. The price includes a 10% fee for the auction company, Gooding & Co. The name of the buyer was not immediately available. The name of the seller, described in Gooding auction catalog as "a preeminent collector with a passion for Italian automobiles," is also undisclosed. The car, a 1957 Ferrari 250 Testa Rossa, was the first Testa Rossa built, and served as the prototype for all subsequent Testa Rossa race cars. The car has a 300-horsepower 3.0-liter V-12 engine and a four-speed manual transmission, and it had an eight-year racing history in both Europe and the United States. It won first place in the 2006 Pebble Beach Concours d'Elegance, an event where classic cars are judged based on their appearance. The auction in which the car was sold was held in conjunction with the 2011 Pebble Beach Concours d'Elegance. The annual Pebble Beach Concours has become a major automotive event, where several high-priced car auctions are held and luxury automakers unveil new models. This year General Motors' (GM, Fortune 500) Cadillac division unveiled a plug-in car that will soon enter production, and a large convertible concept car. Also, Nissan's (NSANY) Infiniti division unveiled a new seven-seat SUV, while Toyota's (TM) Lexus division unveiled a new GS sports sedan. The previous record for a car sold at auction was the $12 million sale of another 1957 Testa Rossa in Maranello, Italy in 2009. "The $16.4 million sale of the prototype at Gooding goes to show that the market for great racing Ferraris is very competitive and collectors want to have the most significant example as the centerpiece for their collection," said McKeel Hagerty, president of the collector car insurance company Hagerty Insurance. Although this was the highest price ever paid at auction for any car, this Ferrari isn't the most expensive car ever sold, according to Hagerty. Ferraris have sold privately for about twice the price of this car, he said. Today, Ferrari is majority owned by Italy's Fiat Group (FIATY), which also now controls Chrysler Group of the U.S. Piero Ferrari owns 10% of the exotic car maker and Mubadala Development Company of the United Arab Emirate owns another 5%.